Distinguishing Characteristics Biracial (Caucasian/Pacific Islander) male. Dark brown hair, brown eyes. Aikau's nickname is Eddie. Aikau was raised on Maui in Hawaii with his five siblings. His father took the family on regular surfing excursions at Kahului while Aikau was a child. He developed a keen talent for the sport during his adolescence. Aikau dropped out of high school, where he was considered a good student, to work at the Dole Food Company's cannery during the 1960s. He wanted to be able to spend his mornings surfing, which his work schedule allowed. Waimea Bay reigned as Aikau's favorite surfing spot. He arrived at the beach one day during 1967 and impressed the professional surfers with his talent. Aikau rode massive waves on his red surfboard with a smile on his face. He was welcomed by his fellow athletes. Aikau established himself as an unofficial lifeguard and mediator at Waimea Bay as well. He often dove in the ocean to assist swimmers and surfers in trouble and helped end arguments on the beach. Aikau was named as an official lifeguard shortly thereafter, even though he did not graduate from high school. An exception was made in his case as the result of his incredible skills. No one drowned during Aikau's shift. It has been established that he saved dozens of lives at the beach, but he failed to file many lifesaving reports. It is believed that Aikau saved many more beachgoers. 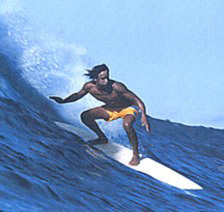 The phrase "Eddie Would Go" became popular around Waimea Bay and elsewhere during the early 1970s, as Aikau gained a reputation for jumping into any perilous situation. He was named Lifeguard Of The Year in 1971. Aikau was known as a humble person who did not believe he was above any of his peers. Aikau joined the International Professional Surfing (IPS) tour in the 1970s. He was regarded as one of the sport's premier athletes for several years before embarking on additional interests. Aikau's older brother was killed in an automobile accident after serving in the Vietnam War in the mid-1970s. Aikau became interested in the native Hawaiian culture afterwards. It was during the Hawaiian Renaissance movement burgeoned on to the scene. George Helm and others were involved in the movement. The Polynesian Voyaging Society (PVS) decided to launch a re-creation of the Hawaiian settlers' routes in 1978. The Hokule'a, a replica of one of the canoes used during the voyages, was built shortly thereafter. The double-hulled canoe was named after the star Arcturus. The PVS selected a number of Hawaiians to serve on its crew. Aikau was one of the crew's candidates selected for the craft's maiden voyage, which was scheduled for the evening of March 16, 1978. Hawaii's governor and several news crews were on hand as the Hokule'a set sail from the Magic Island dock at approximately 7:00 p.m. The volatile weather conditions at the time of the craft's departure were less than ideal, as the canoe was not designed to battle heavy surf. 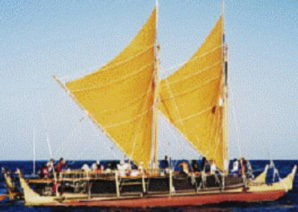 The Hokule'a took on water several hours into the voyage as the result of the choppy seas. The crew was near the Kaiwi Channel at the time of the incident. A wave hit the canoe and its impact caused the Hokule'a to flip over. The crew members spent the night clinging to the overturned hull. No one responded to the flares they lit at the scene. Some members were doubtful that rescue efforts would arrive in time. Aikau estimated that Lanai was approximately 12 miles away from the capsized craft. The crew's officers agreed that he should paddle on his surfboard to locate assistance. It was impossible to gauge an accurate distance to land from the crew's location at the time. Aikau tied his board's leash to one of his ankles and hung a portable strobe light and oranges around his neck. He tied a life jacket around his waist before paddling away from the canoe. Several crew members saw Aikau toss the life jacket into the surf several hundred feet away from the canoe. He was last seen riding on his board as he paddled into the distance. Aikau has never been heard from again. The Hokule'a remaining crew members were rescued several hours after Aikau left the scene. The largest air and sea search in Hawaiian history was initialized after authorities were unable to locate any trace of Aikau in the surf. His board and supplies were never recovered either, and he was presumed to have drowned at sea. Aikau has since taken on legendary status in the Hawaiian culture. The Quiksilver In Memory of Eddie Aikau Big Wave International Surfing Meet was designed by George Downing, a veteran surfer. Downing created the event to emphasize outstanding performances in big wave conditions at Waimea Bay. A plaque was dedicated to Aikau at the same location after his disappearance. Bryan Wake created a play entitled Eddie Would Go, which opened in Honolulu, Hawaii in 1998, 20 years after Aikau disappeared. The Hokule'a continues to occasionally embark on its journeys. A photo of the replica canoe is posted below this case summary. Bumper stickers featuring the phrase "Eddie Would Go" remain popular throughout Hawaii. Aikau's case is no longer investigated by law enforcement, but his memory lives on. Updated 3 times since October 12, 2004. Last updated August 3, 2013; four pictures, height and weight added, distinguishing characteristics updated.